CHA is well under way and I've been painting at the iLoveToCreate booth and meeting up with my artsy friends and roaming the show floor. I love seeing everyone at the show...old friends, new friends, great products and fun demos. 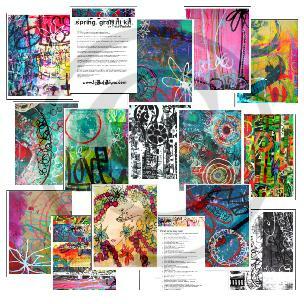 iLoveToCreate~ 9:00am-12:00pm~ come paint & collage with me! Thanks for sharing your inspirations!! ***If your comment is listed here, please send me your email and I will send you a FREE digital collage kit. #17 Color, Passion, Design - Posted by: Carol B.
everyone that enters my path. and everything finds its way into my art. There are so many things that inspire my artwork…a walk on the beach, flipping through a fashion magazine, making art with kids, a thought, an idea, a word, a photograph. I carry my digital and video camera everywhere. I take inspiration photos of interesting shapes, signs, art, flowers, etc. These photos make their way in my art through doodles, altered backgrounds and sketchbooks. I love old craft books from the 60’s and 70’s, I revamped techniques based on traditional macramé and latch hooking in the bindings of my journals. Fashion and magazines are a great reference for photography, color and images for the faces that I draw. Typography is another one of my loves. I study letterforms and ad layouts for interesting ways to incorporate type and freestyle lettering in my art. I used to teach K-12 art and found that working with kids inspires creative freedom when creating artwork. Valentine's day is coming up...these would make great gifts!